Below are the top ten features your friends who use iOS devices are probably freaking out about at the moment. Maybe some of them simply cannot believe how revolutionary iOS 8 is, but hopefully they recognize that a lot of iOS 8 is just Apple catching up to Google and features its Android platform has had for years. On the other hand, some of these improvements would be great to have on Android. That’s right, you can now add widgets right onto your iOS home screen… Oh wait, just in Notification Center. But it’s still an improvement. Apple actually introduced widgets and Notification Center all the way back in iOS 5, then sort of removed them in iOS 7, but now they’re back with a vengeance (and third party developer support). To add a widget from an app, simply pull down Notification Center, tap Edit at the bottom of the display, and then select the widget and order you want it to appear. Sure, iOS has had dictation as far back as iOS 5 with the introduction of Siri, but it was only as fast as your data connection (which at the time was 3G or HSPA unless you happened to be on WiFi). Your words were sent up to Apple’s servers, processed, and then read back to you or typed out onto the screen. With iOS 8, dictation is rendered on the device instantly, like Android users have enjoyed since a little release called Ice Cream Sandwich. App extensions are arguably the most important addition to iOS 8. 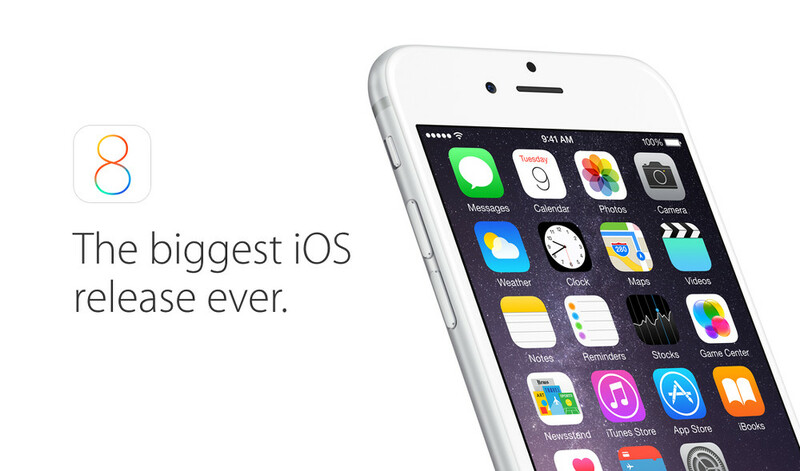 Up until iOS 8 apps were divided into silos so that they could not access each other’s data. This placed a huge limitation on what developers could do and how apps could communicate to each other. Apple slowly integrated some sharing with the share sheet in iOS 6, but the functionality was limited to built in third party apps like Twitter and Facebook. Now, apps can send extensions of themselves into other apps, which allows an app like 1Password to integrate with Safari directly. Extensions has enabled a whole new class of app on iOS and we’re just beginning to see what developers will do it with. While Android apps have been able to share data with each other through intents for years, Android still doesn’t have a way to securely inject part of one app into another like extensions. 2012 is calling and it wants to know what iOS users think of Interactive Notifications (or Expandable Notifications as Google likes to put it). iOS users can now interact with notifications on the lock screen and in Notification Center. My favorite instance of this is when I receive a new text message notification; pulling down on the notification brings up the keyboard to allow me to type a response without opening the Messages app. Developers can determine what kind of actions to show users just like on Android. Fleksy, Minimuum, SwiftKey, Swype, and others are all finally available on iOS. Most of the keyboards look similar or identical to their Android counterparts. Third party keyboards don’t allow access to voice dictation, but emoji are still intact. I personally still prefer the stock keyboard, but SwiftKey works the best for me of the keyboards we’ve seen so far. The Messages app now includes a Details screen for each conversation. From Details you can instantly view the location of any contact who uses Find My Friends, share your location for a period of time, send your current location, mute a thread, leave a group message, and view all media that has been sent and received in the thread. Basically, the Details screen has brought the Messages app closer to parity with other messaging apps like Hangouts, WhatsApp, and Line while exceeding the incumbents in some areas. Starting with iOS 8 users can opt into iCloud Drive. iCloud Drive is essentially a clone of Dropbox, One Drive, and Google Drive. It won’t be available on OS X until Yosemite drops, so users should probably wait to upgrade from iCloud proper if they use any applications that sync using iCloud on the Mac. Pricing for iCloud Drive is relatively competitive (5 GB free, 20 GB for $0.99/month, 200 GB for $3.99/month, 500 GB for $9.99/month, and 1 TB for $19.99/month), although the free tier remains small for iCloud backups and data storage. Speaking of a lack of space, Apple has also set the default behavior in the Messages app to delete pictures and videos in order to save space on devices. It’s fairly easy for an iPhone to lose 1 GB or more to media-heavy messaging threads, so now attachments will automatically delete unless the user taps the keep button. Apple has also added the options to snap a picture, record a video, or send a voice message with the swipe of a finger. Remember when Microsoft revealed their brand new video stabilization technology and then a few weeks later Instagram dropped Hyperlapse (a product instead of a demo)? Apple has now integrated a time lapse option into the camera app. Perhaps even more importantly, Apple finally added a timer in the camera app so people don’t have to use third party apps like Camera+ just to take a family picture. No capture upon detecting a smile, though. That’s the sort of thing that iOS users have to wait another few years for. Imagine having the power of Google Now in the palm of your hand. Wow, a lot of you are really good at imagining. Oh, you just have an Android phone with Android 4.1 or newer? Well aren’t you fancy. iOS 8 (and Yosemite) now feature some much needed enhancements to Spotlight search. If I search for Guardians of the Galaxy on my phone Spotlight will now show me movie times, the beginning of a Wikipedia article, the album (which is really good by the way) or let me search the web and Wikipedia. Spotlight will also search through my emails, notes, and other data repositories to try and find what I’m looking for. The main reason this exists, of course, is to circumvent Google and lower their revenue on iOS. There are, of course, plenty of other new things about iOS 8 that I didn’t cover (like third party access to Touch ID and multitouch gestures on the iPad randomly turning off), but this should get you up to speed with most of the things you’re tired of hearing about. If you’re wondering what the staff thinks about the rest of Apple’s announcements (as well as some, gasp, Android related news), be sure to check out last week’s Droid Life Show.